Start with an hour of technique to warm up, then learn repertory created especially for the Festival Concert, rehearse, perform! The Festival Concert is open to the public, a fully professional performance featuring performances by the acclaimed professional artists leading the Festival and YOU! 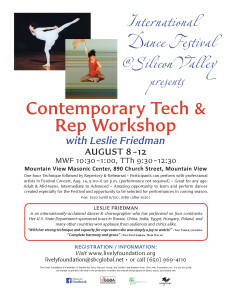 Dancers in this workshop also have the opportunity to perform In Leslie Friedman’s Lively Foundation performances in the coming season. (You may take the workshop even if you do not want to perform.) Leslie Friedman is the legendary artist whose international performances were historic “firsts” for an American dancer. First to perform, choreograph, teach with joint US/host country sponsorship in many countries including China, Russia, India, Poland, Hungary, Egypt and more. 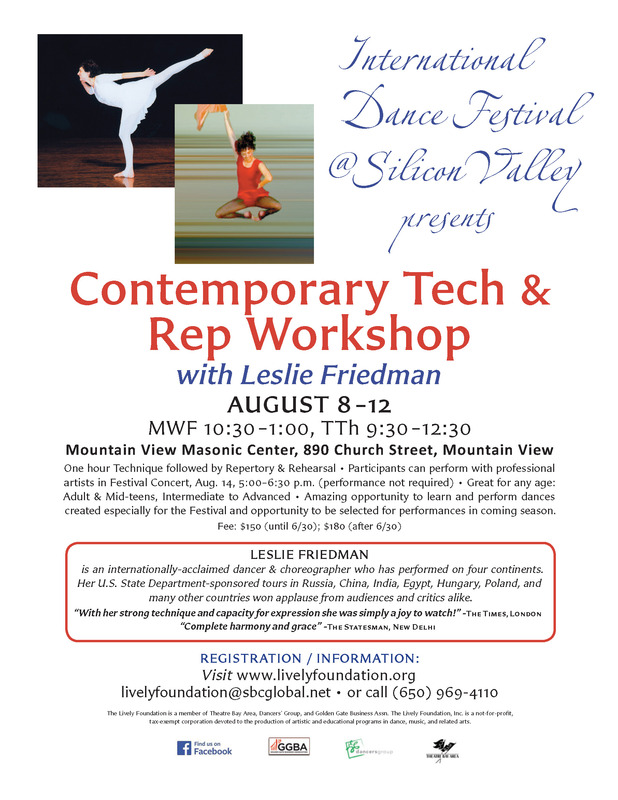 This entry was posted in INTERNATIONAL DANCE FESTIVAL-SILICON VALLEY and tagged choreographer, Contemporary Technique, Dancer, Festival Concert, Festival Dancers, International Dance Festival-Silicon Valley, Leslie Friedman, Repertory Workshop on July 24, 2016 by Leslie.